Home › Energy-Efficient LED Lighting › Ecandy 30Cm 8 Tube 144 Leds White Color Meteor Shower Rain Lights Waterproof ..
Ecandy 30Cm 8 Tube 144 Leds White Color Meteor Shower Rain Lights Waterproof ..
Low-voltage power supply, IP64 waterproof, Certificated by CE, more durable. Every bulb turns on and out one by one in sequence like snow fall, richer colors, very beautiful.Widely used for market Engineering lighting, architectural decoration, also good to use to decorate trees along streets, parks, rivers, urban night lighting, attractions landscaping, gardening, community night crystal decoration, hotels, shopping malls, night entertainment all over the environment decoration. Color: White | Size: 144 led Features: led shower meteor rain lights, meteor effect, romantic aesthetic Low-voltage power supply, IP64 waterproof, more durable. Every bulb turns on and out one by one in sequence like snow fall, richercolors, very beautiful. 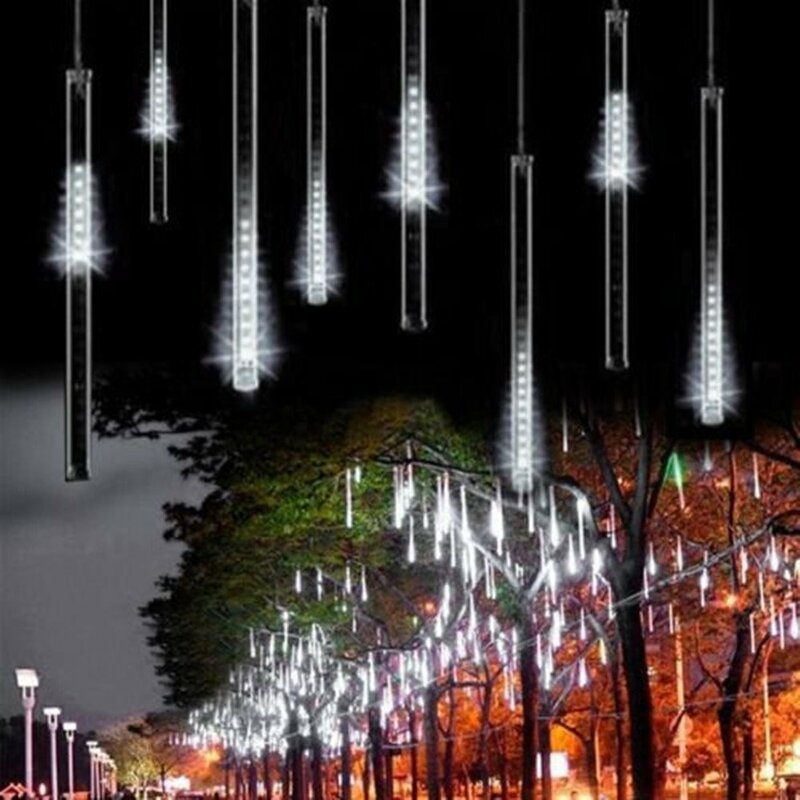 Widely used for market Engineering lighting, architectural decoration, alsogood to use to decorate trees along streets, parks, rivers, urban nightlighting, attractions landscaping, gardening, community night crystaldecoration, hotels, shopping malls, night entertainment all over theenvironment decoration. Specification: Power: 5W Input voltage: 110V-220V Number of Tube: 8pcs Tube Length:30cm Material: High quality transparent PC material. LED Color: White Number of LED lights: 144 LED Lights LED Life Span: 30.000 hours. AC Plug Type: US Plug Package includes: 1x led meter lights Notes: 1.The power voltage is permitted in +10%~-10% fluctuating. If it is beyond thesaid scope, it would influence lifespan, even unlighted or burnt out. 2.Make sure connecting wire is connected and sealed well to avoid defendingElectricity Leakage. 3.Make sure waterproof protection, and no defending Water leakage beforeconnecting to extra power supply. 4.Before maintenance, make sure the power cut off. After assembling right, itcan be connected power to use. 5.No breaking to any stipulation of fireproofing. Please ask Professional toinstall.